Handheld games have an unfortunate tendency to be overlooked in the copious GOTY awards at this time of year, but the lack of this in the popular lists – not this one, then – is a tragedy. Good for Animal Crossing and Zelda, which are great, but here we have a B-tier Nintendo franchise upping its game on a spectacular scale. The 3DS has had a spectacular year, by all accounts, and its earliest hit was my favourite. Its presentation is lovely, from the personality-filled 3D models to the animated cut-scenes that almost justify the stereoscopic effects on their own. It’s the perfect standard bearer for the features of the 3DS, introducing me to StreetPass, SpotPass and the rest through well thought out integration. Plenty of free DLC as well. Sad that that seems like an aberration today. Credit, too, for 8-4‘s brilliant translation. True to the setting and humorous without being obnoxious, even while including Internet memes in its dialogue – something I still find hard to believe is possible. 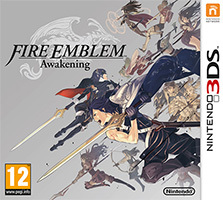 Awakening is a great starting point for Fire Emblem neophytes, with little baggage from the previous instalments and even – cover your ears, purists – the ability to disable what was once the series’ USP: permadeath. This nod to accessibility should be praised rather than reviled, for this game’s unexpectedly strong sales performance – who knew that a good game on a system that was starved of great software would result in sales? – look to have kept it alive. If the standards are this high, here’s to many more.